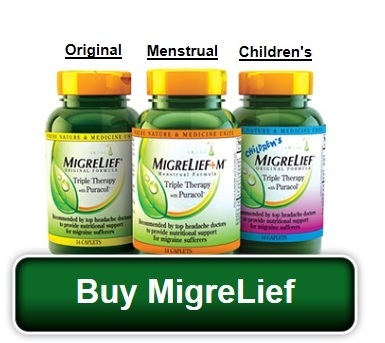 MIGRELIEF+M IS GUARANTEED TO CHANGE YOUR LIFE! There is a direct relationship between hormones and headaches. Headaches in women, particularly migraines, have been related to changes in the levels of the female hormones estrogen and progesterone before, during and after a woman’s menstrual cycle. These hormone levels fluctuate dramatically and are also associated with a large percentage of migraines in women approaching menopause. Menstrual migraines are often more severe, last longer and are more difficult to treat. Migraines that first occur around your menstrual cycle may become chronic over time. Migraines beget migraines… Researchers believe the more you have the more you get. Migraines are connected to increased stroke risk. Migraines are listed in the top 20 most disabling diseases by the World Health Organization. Migraines can lead to “Rebound Headaches” or MOH (medication overuse headaches) a vicious cycle of recurring migraines that can be difficult to break. All 3 types of menstrual related migraine attacks are often more severe, last significantly longer and are more resistant to treatment than the usual non-menstrual migraine attacks. • On average, a menstrual migraine lasted 23.4 hours vs 16.1 hours for non-menstrual migraines. • Medications to treat the pain of migraines were 50% less effective when used to treat menstrual migraines. • Even when the pain medication did work, the risk of the menstrual migraine reoccurring was much more likely. Until MigreLief+M, no one medicine was available to manage both hormonal and blood sugar fluctuation, migraines and other symptoms associated with a woman’s hormones or menstrual cycle. As well as migraines, its active ingredients have been shown to also significantly decrease PMS (pre-menstrual syndrome) symptoms such as cravings, breast tenderness, bloating, cramps, depression, irritability and weight gain. A women’s monthly cycle causes significant fluctuations in estrogen during certain time of the month. These hormonal fluctuation (decreasing levels of estrogen) are known to trigger menstrual migraines in as many as 1/3 to 1/2 of women with migraines. Therefore, the decreasing levels of estrogen associated with menopause, may also trigger migraines in women. Prevention through diet, exercise and supplementation can help to regulate these fluctuations. If your migraines, whether hormonal or not, are occurring several times a month or more, and you find yourself unable to function while reaching for pain medications more and more, you are a good candidate for migraine prevention, to stop migraines from occurring in the first place. 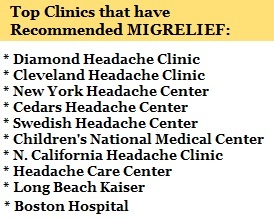 MigreLief has helped thousands of sufferers regain control of their migraines and their lives. Migraines (menstrual or otherwise) are a risk factor for depression and can also lead to the vicious cycle of “Rebound Headaches” otherwise known as Medication Overuse Headaches. Continuously treating the pain and other symptoms of migraine with prescription and over-the-counter drugs can eventually increase the frequency and tendency of your migraines. This is a difficult cycle to break and often calls for detoxing and weaning off of medication. MigreLief+M is a safe, proven effective nutritional approach to maintaining healthy and normal cerebrovascular function. Nipping migraines in the bud is key to keeping control of your headaches and your life. WE ARE CONFIDENT MIGRELIEF+M WILL WORK FOR YOU! 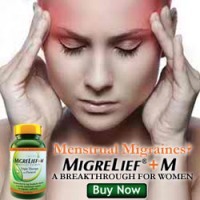 If you suffer menstrual or hormonal migraines, consider trying MigreLief+M for 90 days. Even though many people have experienced positive results in much less time, we recommend 90 days to build blood levels for maximum effectiveness, and to control blood sugar swings and hormone fluctuations (1 bottle is a 1 month supply.) 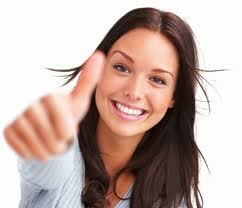 If you are not satisfied with your results for any reason, we offer a 100% money back guarantee of your purchase price.